First, there was Vincent van Gogh. Then came Vincent Price. Following him was Vincent Furnier. And now there’s Vincent Persichetti (1915-1987)–the latest in a long line of distinguished Vincents, each of whom has made a huge impression on the worlds of art, music and film. Just kidding. 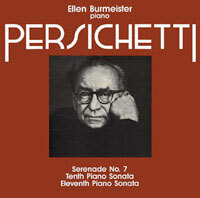 This here Piano Sonatas 10 and 11 CD is a reissue of an old LP that collects three works for solo piano composed in the 1950s and ’60s, but not recorded until the 1980s. The liner notes describe Persichetti as “one of the major figures of American music of the 20th century.” Really? Before this CD was released, I had never even heard of his name before. No matter, let’s get down to the music. You are currently browsing the archives for the Vincent Persichetti category.